This machine carries a clear, valid US title for Arizona. 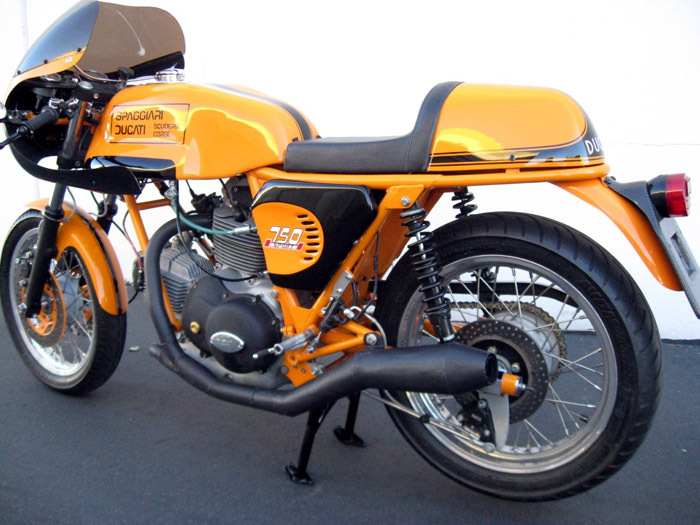 I am offering "For Sale" this twin of my 1973 Ducai 750 Desmo Spaggiari vintage racer for street or track as it has many items that came from my Spaggiari AHRMA and CCS race bike in addition to new trick race items. Frame number is DM750S*755317. 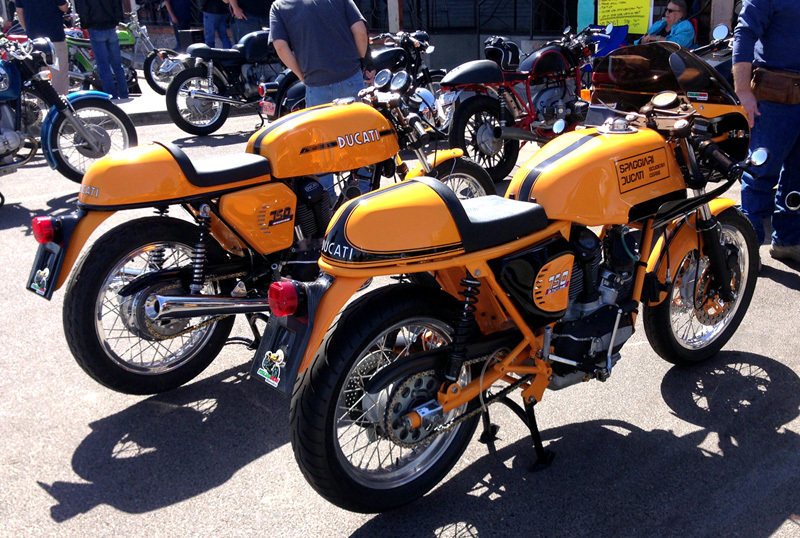 This was my dream to build a twin copy of my Vintage Racer for use on the street. It was only a dream until I was given the opportunity to buy a large bevel drive inventory from The Netherlands. 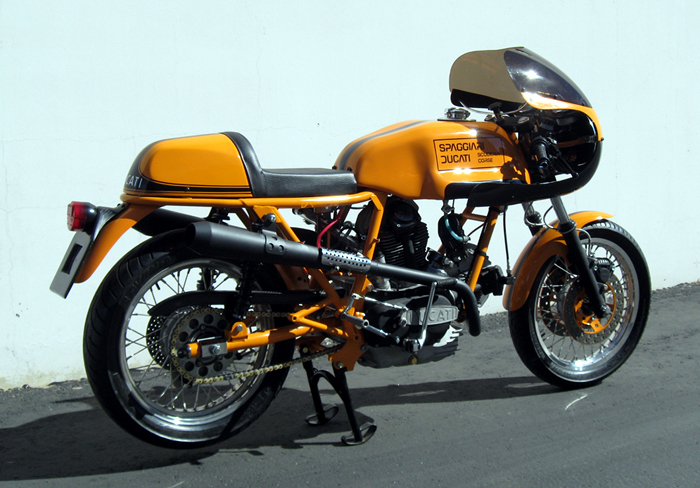 This beautiful motorcycle is my last Round Case bevel drive Ducati that I will sell. The condition of this bike should NOT be considered "Unknown" as most everything is NOS or brand new. Malcolme Tunstall from Syd's Cycles built this engine to match the Desmo structure of my Vintage Racebike. The engine has been fully rebuilt from the crank up and Malcolme built this "Blue Printed" version of my Spaggiari Desmo vintage race bike. Malcolme is a very talented racer and tuner in his own right and he and Syd have shared their expertise and a number of race bits with me over the years when I was most active in Vintage Racing. It was a natural decision to make a spirited race engine out of this Sport engine which is how my race bike engine also started its life. There is a great deal of money that went into this engine to complete a full from the crank up "Blue Printed" engine to factory race specifications. The crank was magna-fluxed and Falicon balanced the new lightened Super Sport rods. Malcolme used Hasting piston rings on Borgo Super Sport pistons. All bearings to include the main engine bearings are brand new and not the cheap items that can be found on the internet. Viton valve guides and a new electronic ignition were installed. All transmission gears that needed replacing were replaced with NOS items. Additionally, ALL bevel gears in the bottom end of the engine are NOS and were replaced as well as a new clutch and internals. There is also a large billet oil pump from Ducati Kamna in Germany for maximum oil flow. The engine cases were also pressure tested and any hairline cracks or imperfections were professionally welded and fixed. The cases and lines were bored professionally to take the Super Sport Borgo pistons and we used 900 ss Desmo heads with new rockers. This race spec engine picks up revs very quickly like my race bike but it also starts on the first kick and with the lever. The kick-start lever is off of my race bike and it has a reinforced boss and is not, therefore, original. However, I have the original Sport lever if you prefer. You can choose either lever. This engine, number 755606 DM750 started its life as a 750 Sport and came with a damaged narrow frame. 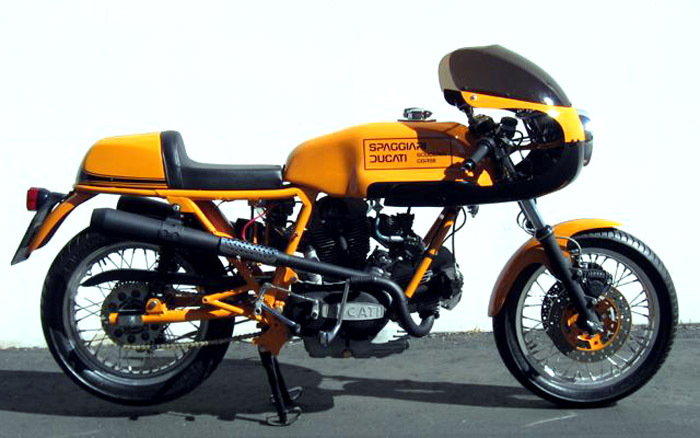 When I conceptualized this bike, I decided to combine the best of the Spaggiari racer and the comfort of the 1972 Sport of which I have restored and owned 2. The deep orangey-yellow Sport was computer matched from those bikes and I had copies of the striping that I made into decals. As I was able to travel with my wife to Italy this year to celebrate our 30th Anniversary, a trip to the Ducati Museum was on the schedule. I was able to stand next to the original Spaggiari Ducati Scuderia Corse race bike that I modeled my bike after and I can say that it is a very faithful copy of that bike. As a result, in combining the best of the Spaggiari race engine, I decided to use a GT frame with the wider rear seatbase as I had additional 72 Sport style bodywork. Additionally, I was able to create the same rear set mounting points as on my 1972 Sports. Now that I am a "broader", older guy, I find the wider rear subframe to be very comfortable when riding at full speed and full lean. There are 2 sets of exhausts that come with the purchase of this beautiful motorcycle. First there is a 2:1 system for the street with baffling and a set of Imola high pipes when going to the track. Both sets of pipes have been ceramic coated. 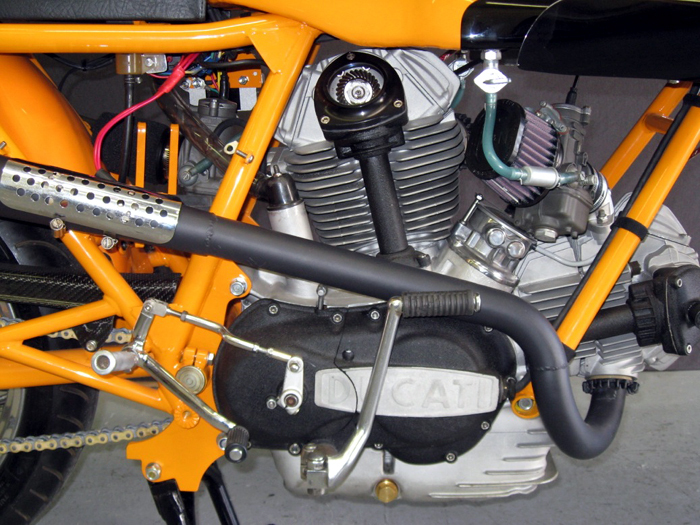 The 2:1 exhaust system came off of a Dutch race bike and in my opinion has real character, however, the Imola high-pipes are recently manufactured. The aluminum Imola race fuel tank has not seen fuel until last week. It has the internal baffling to minimize the weight shifting of fuel load upon hard braking and hard acceleration. I bought this aluminum piece of race art in Germany and it is a top quality item. There is a Monza cap (my preference) for street use and there is also a flat aircraft style fuel cap that comes with this machine for the track. The 18" Super Sport wire wheel set with 3 disc brake set-up came from Syd's Cycles. Malcolme knew that I was racing my bike and recommended my using these strong Akront rims with stainless steel spokes on the original hubs. I really like the strength of this wheel set at the track as it is very confidence inspiring. Floating rear brake caliper is thanks to my friends at Syd's. If you will be racing this machine in Europe, I can supply undrilled discs for the front wheel as well as the caliper carrier for Lockheed style brake and magnesium caliper carrier as I understand that a floating rear brake system and drilled rotors is not allowed in European Vintage racing. Those items will be included in the sale of this machine as well. Avon rubber is new and thanks to Steve at Bevel Heaven. Front is AM 22 and 110/80 and rear is AM 23 and 130/65. I am also using the rebuilt Cerriani front forks that came with this Sport and rebuilt with the Works spring kit from Bevel Heaven which makes a huge difference in performance. Totally restored Marzocchi rear shocks hold up the rear of the bike. The dual disc set up came off of my racer but the Grimeca master cylinder is new as well as the new front Brembo F08 calipers. As this is a race replica, I had chain guards made in Carbon Fiber as well as the license plate bracket. They are new and the fabric of the carbon weave is dynamic which is why I kept them in this state. However, would consider painting if preferred. Front fairing is 900 Super Sport as is the instrument dash that houses Veglia tachometer and speedometer that were original to the Sport. 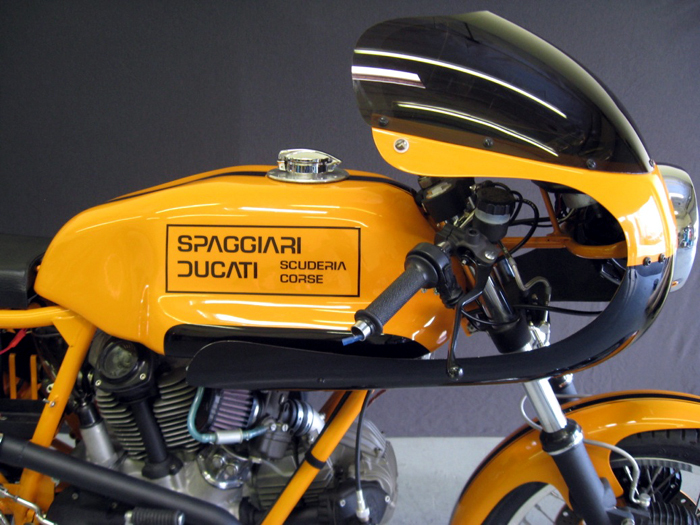 We painted the frame the same 72 Sport yellow like the Spaggiari race bikes and the front fairing, both fenders, seat base and side-covers are painted that same 72 Sport yellow with the black 72 Sport decals on the seat base and side covers. Originally, I had the "Z" painted on the Imola tank but due to the size of the tank , I decided to use the additional set of Spaggiari decals on the Imola tank that I believe look much better and are more proportional. I am pleased with how the color scheme of the bike worked out and it is very satisfying to be getting the accolades on Social Media or when this bike is in public. 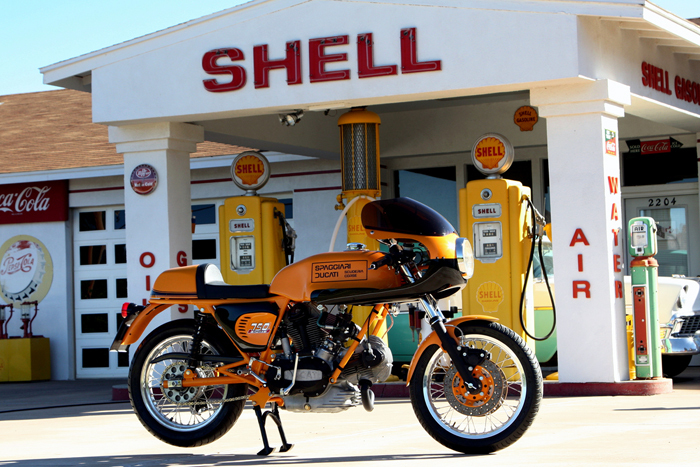 This Spring 2014, the beauty of this motorcycle was recognized and resulted in winning Best In Class for Italian bikes at the Tucson Vintage Motorcycle Riders Association Vintage & Classics Motorcycle Show for Southern Arizona. However, this Ducati 750 Desmo with a headlight and brake light is far more magnificent due to the performance of this race prepped engine with 36 mm Del Orto's! She truly performs as well as she looks. 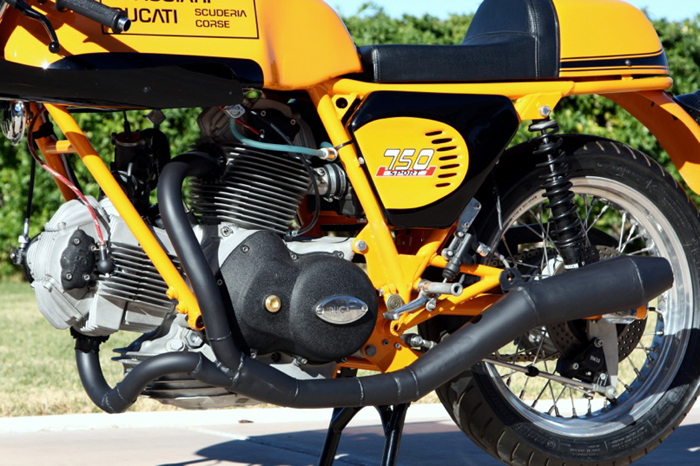 As this Ducati 750 Desmo Spaggiari styled motorcycle was built for spirited riding on the street, we made our own wiring harness/loom and use a modern, more reliable fuse box and voltage regulator. Our philosophy is to keep the soul of the vintage race bike but upgraded with modern components for safety and for reliability purposes. I have the original items if you prefer. For states or countries that require turn signals, the clip-on's are wired for Bosch style bar end indicators that can be seen at the front as well as the back of the bike. A set of these bar end turn signals is included. In conclusion, this is a fully restored Ducati "Round Case" motorcycle and with a "Blue-Printed" desmo bevel drive engine. The engine has run long enough for tuning of the carbs and for one test ride. 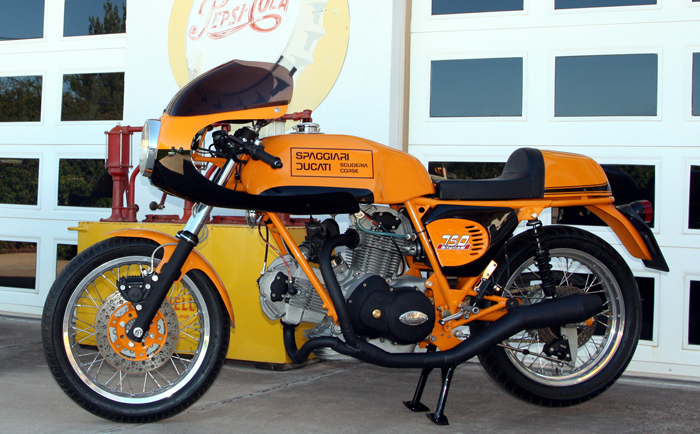 Other than that, this is as new as one can get with a motorcycle that was originally built in the early 1970's. Steve at Bevel Heaven can speak to all of the new parts that were purchased from him to do this restoration and he can be contacted at 925-798-2385 and Malcolme Tunstall can speak to the full engine build and he can be reached at 727-522-3333. This machine carries a clear, valid US title for Arizona. I can be reached by phone at 520-730-7576 or through my e-mail address, italianiron@msn.com. We will work to answer all questions. Will work hard to make shipping of this magnificent machine to your location as easy as is possible. Feel free to visit the bike here in Arizona. Note From Steve Allen: The photos shown above show vast differences in color tone from photo to photo, some looking WAY too dark orange... So I asked Scot to find a photo of the bike along side another Sport to compare colors.... 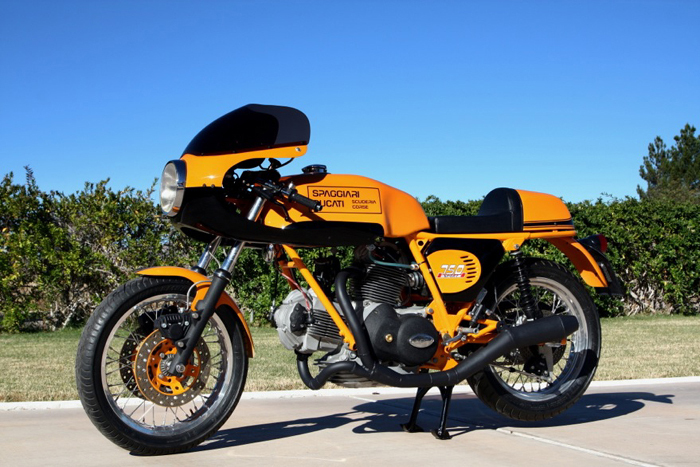 The photo above shows this Desmo along side the other Sport currently offered for sale and as you can see the color is spot on.... Scot has owned several Sports and believe me, he knows the appropriate color tone and this is it. 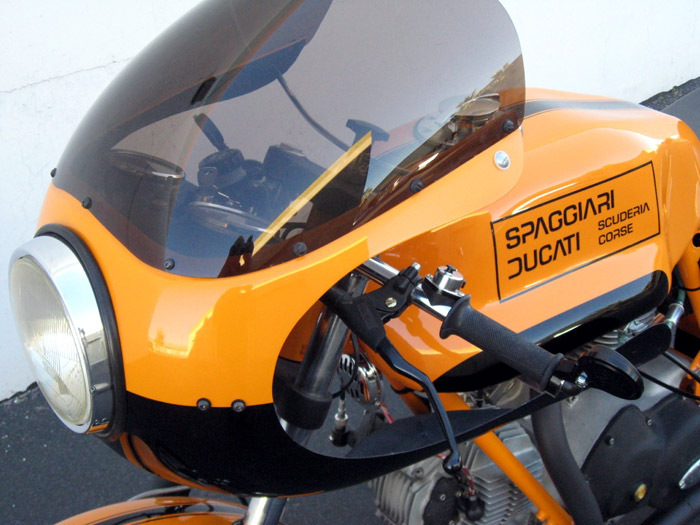 Of course, nothing beats The Original - here is the inspiration for this bike at The Ducati Factory.